Volunteers’ Week is an annual celebration of the fantastic contribution millions of volunteers make across the UK. Volunteers’ Week takes place 1-7 June every year and is a great time to raise awareness of your organisation and recruit volunteers, it is also a good time to thank your existing volunteers and recognise the difference they have made to your organisation. The good news is, Salford CVS can help you do both! 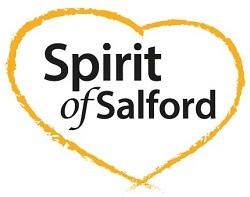 In support of Volunteers’ Week Salford City Council are changing their Spirit of Salford logo orange for the week. The Volunteer Centre Salford are working in partnership with The Lowry to hold a volunteer recruitment event on Monday 4th June from 11am to 4pm. Anyone interested in volunteering is welcome to attend and there will be refreshments served on the day. Salford City Council are holding a celebration event for their staff on Friday 8th June 2018. From 11am to 2pm. The 100, 500 and 1000 Hours Recognition Scheme aims to recognise the valuable contribution that volunteers are making in Salford by awarding a Certificate of Recognition signed by the Ceremonial Mayor of Salford for those who have given 100, 500 or 1000 hours to volunteering. This is one easy but effective way that you can thank your volunteers for their dedication. Why not check your records to see who qualifies for these extra special certificates? All you need to do to join in the scheme is complete a short form, there is no limit to the number of volunteers your organisation can register. Volunteer Centre Salford and Little Hulton Big Local are hosting a celebration event for volunteers who are contributing to community projects across Little Hulton. This takes place on Wednesday 6th June 2018, 11am -1pm at Little Hulton Big Local Community Hub and will include lunch, refreshments and entertainment. The event is also open to people who want to find out more about volunteering in Little Hulton. For ideas, inspiration plus free resources go to the Volunteers' Week website.